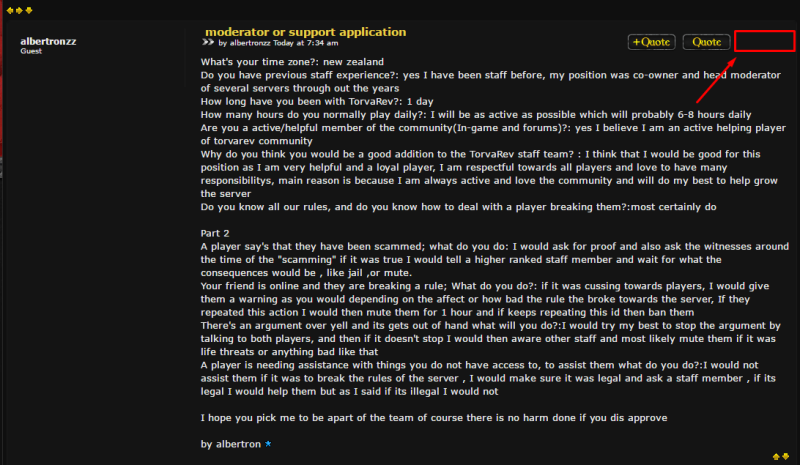 A player say's that they have been scammed; what do you do: I would ask for proof and also ask the witnesses around the time of the "scamming" if it was true I would tell a higher ranked staff member and wait for what the consequences would be , like jail ,or mute. You should definitely be able to, Otherwise delete it, and repost it? But i'm fairly sure deletes in the edit view, so let me know how you go? There is a format for a reason but you could try to ask fatal to edit the title for you but he is busy to try to ask him when he has time spare. The format is fine, the topic ''context'' is roughly okay.. has barely anything to do with the app, it just repeats his username, given it's already posted by? yes him..
And if alex, the site developer has a problem, he has the authority to do something about it.